I am getting ready to put new flooring in my kids bathroom. I have three kids and they’re all under the age of six. I like wood and laminate but are not sure if they will hold up. Any suggestions? Margaret, you’ve certainly got your hands full right now! You definitely want a flooring for a kids bathroom that is water proof. Otherwise you will just have to redo the flooring in a couple of years. I’d stay away from wood and laminate and I’d suggest going with tile or vinyl flooring. When tile is installed properly, it is quite waterproof. The only concern to be aware of is the grout joints, because that is where water can penetrate. As long as you keep on the grout sealing and repair tile can last 20 years. Whether you will still like what you chose today in 20 years, is another question! So if you’re thinking of going with tile, make sure you get one that has good texture and will not be a slipping hazard. Especially with those three young ones at home. You will want something that has just a little grip to it so that when it’s wet it still has some traction. 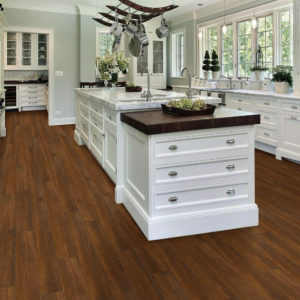 If tile is not the right choice for you, consider going with a vinyl flooring. Select sheet goods for the most water resistance possible. If a sheet vinyl is installed properly, the seams are taken care of and areas where caulking is applied (like the bathtub) are kept up on, vinyl can easily last for 10+ years. Another vinyl option is vinyl plank flooring. It looks similar to laminate flooring but has adhesive strips instead of a click lock system. Vinyl planks are easy to install and when installed properly are also very water resistant. Contrary to popular belief Allure by Traffic Master and Lockhaven by Armstrong are good products and are indeed water resistant when installed properly. Until the kids grow up, I’d stay away from laminate or wood flooring in the bathroom. It is just not designed to take that much water. Laminate and wood flooring is fine in a bathroom setting, when water spilling on the floor daily is not a concern. For now tile and vinyl are your best bet!